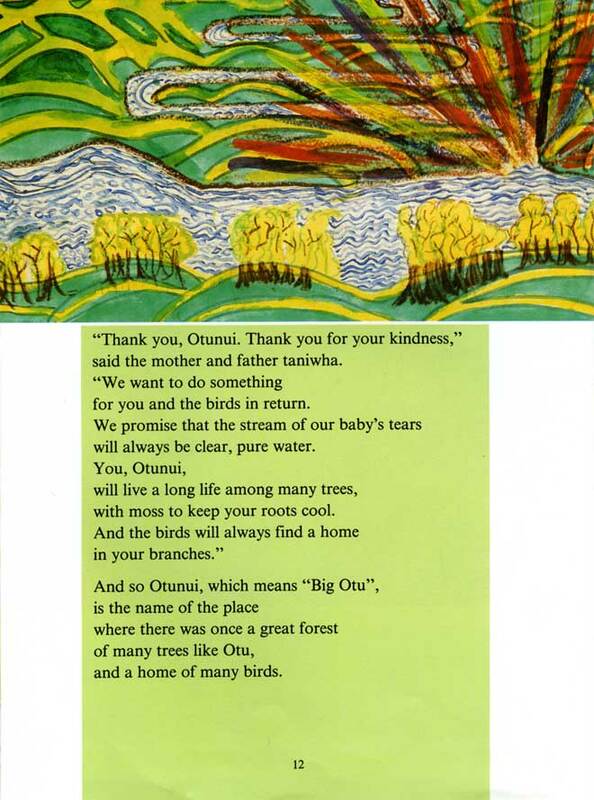 Otunui and the egg is a storybook written and illustrated by the children of Ōtūnui School. It was published by the Department of Education in 1988 and tells the story behind Ōtūnui's name. There were once two taniwha who were tending three eggs on the slopes of Mt Tongariro. Tongariro quarrelled with the nearby mountains Ruapehu and Ngāuruhoe over the beautiful female mountain Pīhanga. Their fighting dislodged the taniwha eggs. Two broke but one survived and was picked up by the sun, Rā, who took pity on it. Rā sent the egg to a nearby forest where it was caught by a great tōtara tree called Ōtū. Ōtū and the forest creatures tended the egg until it finally hatched. The baby taniwha wanted its mother and father and cried a stream of tears ­– as did the parents during their search for the eggs. They were finally reunited with their baby and gratefully promised that Ōtū would live a long life, fed by the baby's tears. This is the last page of the book. Otunui School closed in 2007.